The Ground Effects servo controlled stretch-bending operation simultaneously bends and forms aluminum tubes. 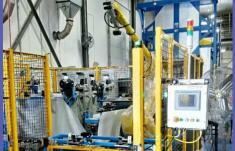 Raw, formed extrusions are moved to a robotic cell to be drilled and de-burred. After this, the pieces are batched and heat treated to increase hardness from T4 to T6. To ensure a consistent, high quality product everytime, Ground Effects uses robotic cells for most cutting, welding and stretching operations.